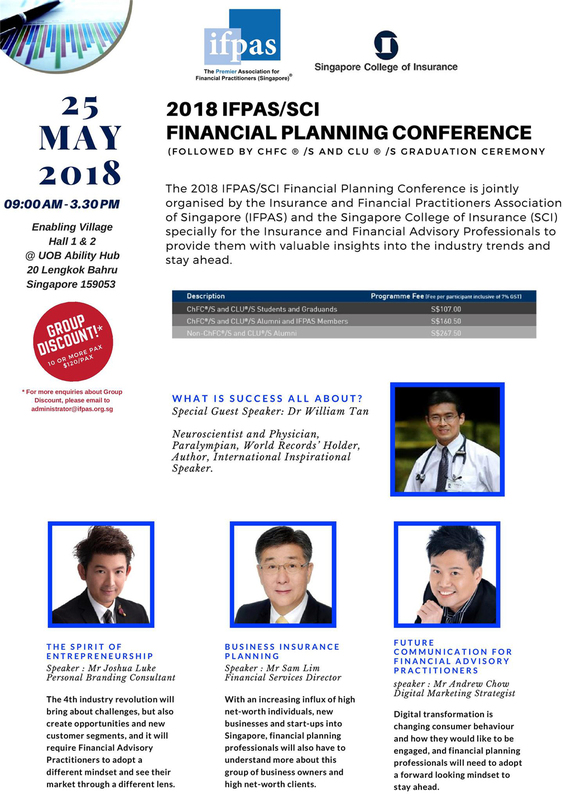 The Financial Planning Conference 2018 is jointly organized by the Insurance and Financial Practitioners Association of Singapore (IFPAS) and the Singapore College of Insurance (SCI) specially for the Insurance and Financial Planning Professionals to gain valuable insights into the industry trends and stay ahead. Digital transformation is changing consumer behavior and how they would like to be engage, and financial planning professionals will need to adopt a forward looking mindset to stay ahead. That will include having an entrepreneurial mindset and spirit, as well as to change and adapt to how consumers think and communicate in the digital age. With an increased focus on entrepreneurship and startup, financial planning professionals will also have to be aware of the specific needs of business, and what are the protection needs and gaps as a business when they put together a plan for business owners, which will also include their specific needs in health care. The Insurance and Financial Practitioners Association of Singapore (IFPAS), the industry’s premier organisation has been in existence since 1978. We have about 5,000 registered individual members, encompassing rank-and-file financial practitioners as well as agency leaders. IFPAS represents the voice of the industry, playing a key role in any legislative and policy-related discussions that affect our profession. We intend to continue in this role, even as we continue to develop our training programmes to aid the professional development of our members. As a major player, IFPAS intends to take the lead in raising the industry’s public profile, by making community engagement activities, including financial education, a key plank of our outreach. The Singapore College of Insurance (SCI) is a not-for-profit professional training and education body set up in 1974, as part of Singapore's efforts to develop as a financial hub. For more than 43 years, the SCI has remained focused in its efforts to upgrade the technical expertise of insurance and financial services practitioners, and to provide them with professional advancement opportunities, through its series of practice-oriented programmes and internationally-accredited qualifications. Since the late 1970s, the SCI has also played the role of an industry examination body to conduct regulatory examinations for those wishing to join the financial advisory, life and general insurance industries. Since 2009, the SCI has also expanded its role to include talent development programmes, such as the Insurance Executive Scholarship Programme (IESP) and the Insurance Management Associate Programme (iMAP) that have succeeded in attracting and placing numerous fresh tertiary talent into the varied functions in the industry. The SCI was voted the Asia Insurance Industry Educational Service Provider of the Year in 1997, 2001, 2007 and 2016. It has international links with professional bodies, such as The Chartered Insurance Institute (CII), The Chartered Institute of Loss Adjusters (CILA), The American College (TAC), The Life Office Management Association (LOMA), LIMRA and The Australia and New Zealand Institute of Insurance and Finance (ANZIIF) as well as with other training institutes in the region, through its involvement in the ASEAN Insurance Education Committee (AIEC) projects. The SCI has also actively helped to set up the Asia-Pacific Risk and Insurance Association (APRIA) to further insurance education, and to promote links between academia and the industry. World Records’ Holder, Author, International Inspirational Speaker. Dr William Tan is a Neuroscientist, Physician and Paralympian. From the Mayo Clinic in the United States, Dr William Tan went to the University of Newcastle, Australia in 1997 to study medicine, after which he won scholarships to study at Harvard and Oxford Universities. Apart from his professional vocations, he is also a Paralympian, World Records Holder, International Inspirational Speaker and Asian-Pacific Games triple gold medallist. He has been the holder of six endurance marathon world records, including “Fastest time to complete 7 marathons in 7 continents (including Antarctica and North Pole) in 27 days”. His resilience in turning adversities (which include childhood poliomyelitis and Stage 4 leukemia) has inspired many. Since 1986, he has devoted himself to advocating for accessibility in the built environment and transportation; for equal opportunity and employment of persons with disabilities. His ultramarathon efforts had helped raised more than S$18 million to support research and needy causes. While he is a successful social media and public relations strategist, entrepreneur and speaker based in Singapore, he is also the best-selling author of a highly popular series of books: Social Media 247, Public Relations 247 and Personal Branding 247. Andrew has spoken in over 15 countries within 5 years and addressed more than 20,000 people on Digital Marketing, Personal Branding, Enneagram, Public Relations and Branding. Andrew’s career of 30 years; has seen him work with an array of clients including AXA Insurance, Abbot Medical Optics, Singtel and Sony Pictures, M1, Starhub, and Sennheiser. Andrew had more than 300 interviews and features about him or his business since 2005 from more than 40 local and regional media. He is listed as the Top 10 Most Influential Speaker in Singapore in 2013 by the Singapore Business Review. He won the Spirit of Enterprise in 2008 and the Successful Entrepreneur in 2010. Before he served as the President of the Asia Professional Speakers – Singapore (APSS), he also won the coveted Spirit of Service Award from the Industry. He loves travelling and held his solo Photo Art Exhibition for 3 days in Singapore to raise funds for a charity – Teen Challenge. As an Entrepreneur who has successfully built an established business, Joshua Luke has won several national and regional awards for his works - ‘Promising SME 500 Award, ‘Singapore Successful Brand Award’, ‘Asia Top Outstanding Enterprise Award’,etc. Armed with years of training experience in the area of Personal & Business Effective Skills: in Effective Sales Strategies, Persuasive Negotiation Skills, Dynamic Motivational Skills, Influential Leadership Skills etc, he is also a qualified 'Advanced Body Language Research & Trainer' and a NLP Practitioner-in-training. Joshua is currently working on his new business book series ‘Empower Me’, which includes the following titles ‘Empower Me in Personal Effective Skills’, ‘Empower Me in Influential Leadership’ & ‘Empower Me in Team Management’, and upcoming ‘Harness The SALES Champion In Me’ and ‘Harness The MOTIVATION Champion In Me’ book. Coach Luke, as Joshua has been known as all these years, has provided both business analysis & sales enhancement consultations, and leadership & team management trainings to Top- & Mid-Management Personnel such as CEOs, Business Owners/Founders, Directors, Managers, etc. for both multi-national corporations and small-medium enterprises. His list of clients includes AIA, Prudential, UOB Bank, L’Oreal (Singapore and Hong Kong), SCENTAL Travel Retail (Asia Pacific), Denza (China), Colourworks International (South Africa), IBICA (USA), etc. Completing his MBA (Master of Business Administration degree) in 2018, he has also created various online analytical & profiling tools’ with his team – such as the Signature Leader Profiling and the MACDOER Personality Profiling, etc. Coach Joshua Luke has been featured on various media platforms for the past years – on TV (MediaCorp Channel 8 and Channel U, 938 Live Radio, Singapore Press Holdings Men’s Health (Singapore) magazine, LianHe WanBao leading Chinese newspapers, etc.). His sales-, work-performance & business-related articles have been published in national newspapers (‘The Straits Times’ national newspapers, etc.) and both consumer- & business- magazines (‘H4UFMe’ magazine, etc). Sam Lim is a Financial Services Director with a Life Insurance Company with more than 30 years of experience. He is a qualified Chartered Life Underwriter (CLU),Chartered Financial Consultant (ChFC) and was awarded the ISO 22222 in Financial Planning by SCI. He also trains and lectures in Brunei, East & West Malaysia, Thailand, Vietnam, Hong Kong, Macau, Indonesia and Taiwan. Neuroscientist and Physician, Paralympian, World Records’ Holder, Author, International Inspirational Speaker. Digital transformation is changing consumer behaviour and how they would like to be engaged, and financial planning professionals will need to adopt a forward looking mindset to stay ahead. The 4th industry revolution will bring about challenges, but also create opportunities and new customer segments, and it will require Financial Advisory Practitioners to adopt a different mindset and see their market through a different lens. - The spirit of entrepreneurship and its relevance to a Financial Advisory Practitioner. - Adopting the spirit of entrepreneurship as a Financial Advisory Practitioner. - Entrepreneurship and IPAD (Intelligence, Passion, Adversity Quotient, Determination) application in the Financial Advisory Industry. With an increasing influx of high net-worth individuals, new businesses and start-ups into Singapore, financial planning professionals will also have to understand more about this group of business owners and high net-worth clients. For high net-worth individuals, business owners of new businesses and start-ups, financial planning professionals will also have to understand their needs in the aspect of Healthcare Insurance. The easiest way to reach here is by MRT to Redhill Station, which is just 5 minutes' walk from here. Our pedestrian entrances are along Lengkok Bahru and Redhill Road. If you're driving, our entrance is along Redhill Road. All entrances are accessible by wheelchair.